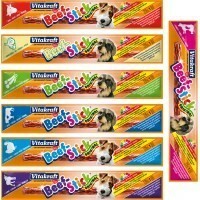 Vitakraft Dog Beef Sticks 12g are mouth-wateringly tasty treats that your dog is sure to love. With a unique taste and smell that stimulates and appetises your dog, these delicious little snacks are perfect for rewarding or treating your dog. Free from artificial colours, flavour enhancers or preservatives, these quality dog snacks are not only tasty, but healthy too!